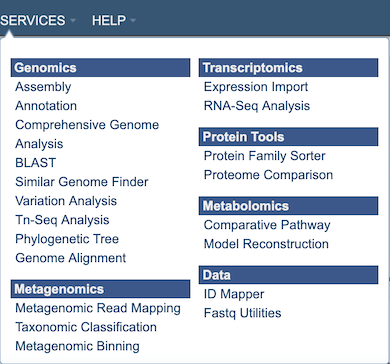 The Comprehensive Genome Analysis Service provides a streamlined analysis “meta-service” that accepts raw reads and performs a comprehensive analysis including assembly, annotation, identification of nearest neighbors, a basic comparative analysis that includes a subsystem summary, phylogenetic tree, and the features that distinguish the genome from its nearest neighbors. 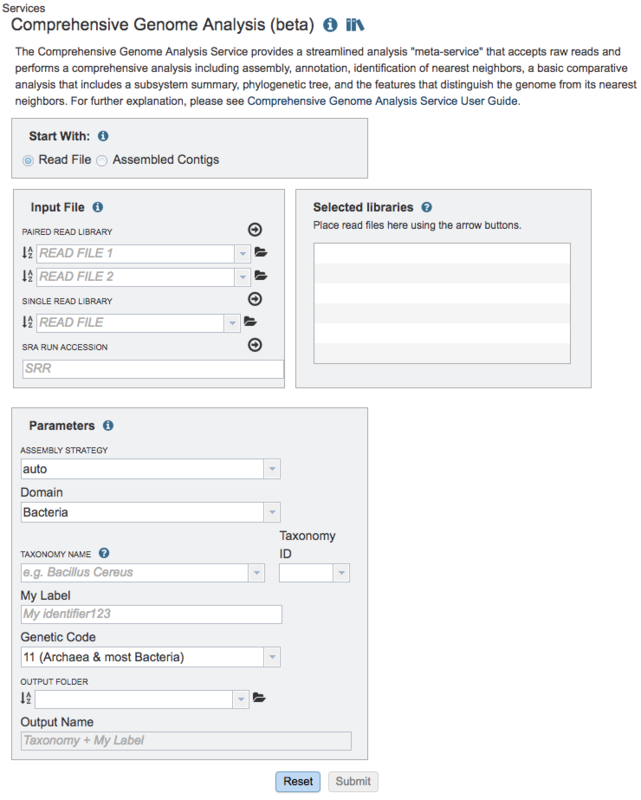 The Comprehensive Genome Analysis submenu option under the Services main menu (Genomics category) opens the Comprehensive Genome Analysis input form (shown below). Note: You must be logged into PATRIC to use this service. The service can accept either read files or assembled contigs. If the “Read Files” option is selected, the Assembly Service will be invoked automatically to assemble the reads into contigs before invoking the Annotation Service. If the “Assembled Contigs” option is chosen, the Annotation Service will automatically be invoked, bypassing the Assembly Service. Depending on the option chosen above (Read File or Assembled Contigs), the Input File section will request read files or assembled contigs, respectively. Read File: The fastq file containing the reads. Note: Available only when “Read File” is selected above. The taxonomic domain of the target organism: bacteria or archaea. The codon translation used in calling genes. annotated.genome - A special “Genome Typed Object (GTO)” JSON-format file that encapsulates all the data from the annotated genome. See Extracting and Mining Genome Typed Objects for more information. 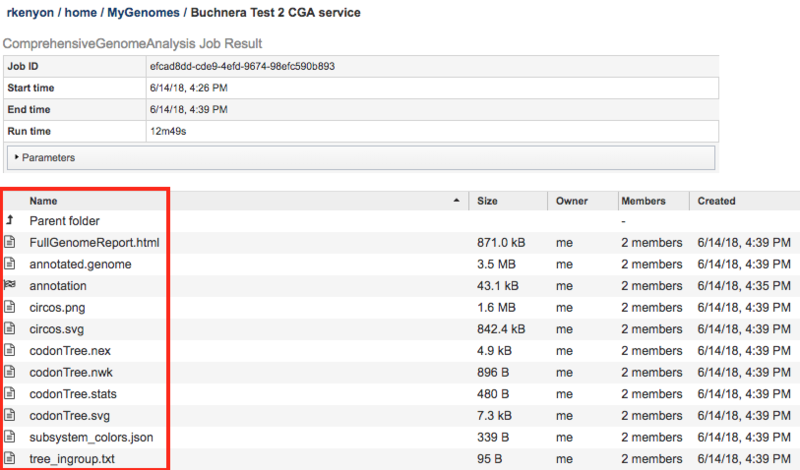 annotation - The Annotation sub-job that was run as part of the CGA Service. Double-clicking this item will display the Annotation job results. Note that sub-jobs are indicated by the “checkered flag” icon beside the name. assembly - The Assembly sub-job that was run as part of the CGA Service. Double-clicking this item will display the Assembly job results. Note that sub-jobs are indicated by the “checkered flag” icon beside the name. circos.svg - SVG-format rendering of the circular genome view used in the FullGenomeReport.html file. circos.png - PNG-format rendering of the circular genome view used in the FullGenomeReport.html file. codonTree.nex - NEXUS-format file containing the phylogenetic tree generated by the CGA Service. codonTree.nwk - Newick-format file containing the phylogenetic tree generated by the CGA Service. codonTree.stats - File containing the statistics on the phylogenetic tree generated by the CGA Service. codonTree.svg - SVG-format rendering of the phylogenetic tree used in the FullGenomeReport.html file. subsystem_colors.json - JSON-format file used for rendering colors in the Subsystem pie chart displayed in the FullGenomeReport.html file. tree_ingroup.txt - File containing the closely related genomes used in building the ingroup for the phylogenetic tree generated by the CGA Service.